Why not come and discover Bulgaria in winter? GARMEN HILLS,because of its location,offers the possibility of a stay where you will taste the joys of winter -alpine and cross country ski - but where you can also choose to discover the country. DID YOU KNOW? The Bulgaria has more than replicas relojes fifty peaks above 2500 m and the RILA and PIRIN mountains rise over 2900 metres! 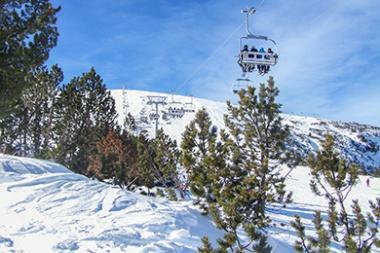 Bulgaria is a popular destination for downhill skiing and several resorts have been developed,among them BANSKO,BOROVETS and PAMPOROVO,and even SOFIA where you can ski on Vitosha mount and enjoy night skiing! BANSKO, 40 minutes from omega replica watches Garmen,today offers the best ski domain (70 km),modern equipments(there are snow guns on all slopes) and infrastructures,which make it the «Winter capital of the Balkans» as it proclaims itself..
Chairlifts rise up to 2650 meters and allow a very good skiing,especially the black run Alberto TOMBA.. In recent years,Bansko hosted several World Cup races. BANSKO offers also a good multi-lingual ski school,and other facilities for tourists such as a skating rink,a swimming pool etc…and a rich night life (taverns and bars).